One of the best ways to keep a sale moving forward is by using the micro-commitment strategy. The approach is simple to use and very effective for those who are dealing with a customer who is hard to engage and hard to move forward. The micro-commitment strategy is built around finding ways to gain the customers agreement with little things during the course of the sales process. A micro-commitment might be as small as confirming a time for the next meeting or it could be more extensive by getting their feedback on a report. People ask if me if this is a closing strategy or a prospecting strategy, and I say it is both. When you use micro-commitments early in the prospecting phase, you can move the customer along to the close faster. 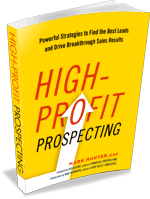 In this manner, it’s both a prospecting and a closing tool you should be using. One of the best ways I like to use micro-commitments is with a prospect who I’m having a hard time engaging. I may send them an email or call them and ask for their opinion on something. It may include forwarding a document or sharing a link, but it’s about getting them to engage in something that will allow me to gain more insight. The email or call is never one that requires significant thinking on their part, but it does require them to share an opinion. When I do this, I’m demonstrating I value the prospect’s opinion and I’m getting them to make a small commitment. The beauty of the email or telephone call asking for their input is I can immediately use their response to then set up a scheduled time to meet or at least talk on the phone. What I’ve done is gained another micro-commitment by asking for their time to meet. If you find yourself in either a long sales cycle or a complex sales process, you’ll find the micro-commitment can be an excellent tool to keep moving the prospect forward. It can become too easy for a prospect to go silent. Having multiple micro-commitments you can use at anytime allows you to keep the prospect engaged. Key, of course, is not the number of micro-commitments you use, but the way you use them to ultimately achieve your goal of being able to close the sale. Each time you use a micro-commitment, ask yourself if by using it you will be able to move the customer one step closer to a sale.